Holiday stay in NYC? Try an apartment! | Oh, the Places We See . . .
← Join us for a Christmas Holiday in NYC! Holiday stay in NYC? Try an apartment! Beautiful ironwork on the front door of The West Townhouse, NYC. The first question we asked ourselves while considering a Christmas Holiday in NYC was this: Can we afford to stay in the city at the busiest time of the year? And the question remains a valid one. In a city where real estate prices are outrageous, hotel stays can quickly wreck a travel budget. Although we’d never experienced Airbnb, HomeAway, or any residences advertised by owners, we were game to try. Fortunately, TripAdvisor came to the rescue. With 192 listings for Specialty Lodging all rated by guests, TripAdvisor offered an unbelievably extensive selection. And thus it was that we stumbled (fortunately for us!) upon The West Townhouse on the Upper West Side. On previous trips, we’ve stayed near Times Square in a chain hotel, but never in a residential area. But we’ve found we like the Upper West Side so much, we’ll probably return. 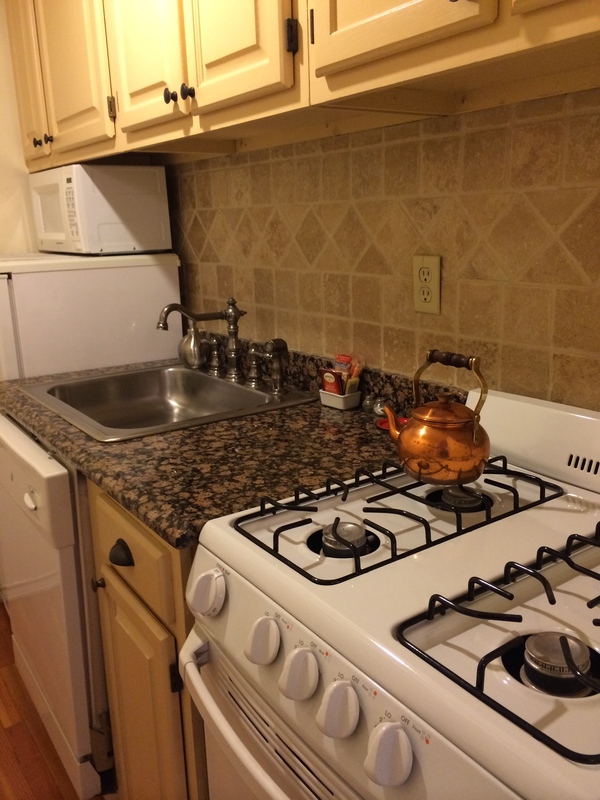 Not only was the apartment spacious and affordable, it was conveniently located in a quiet area, only two blocks from Central Park and NYC subways and buses. 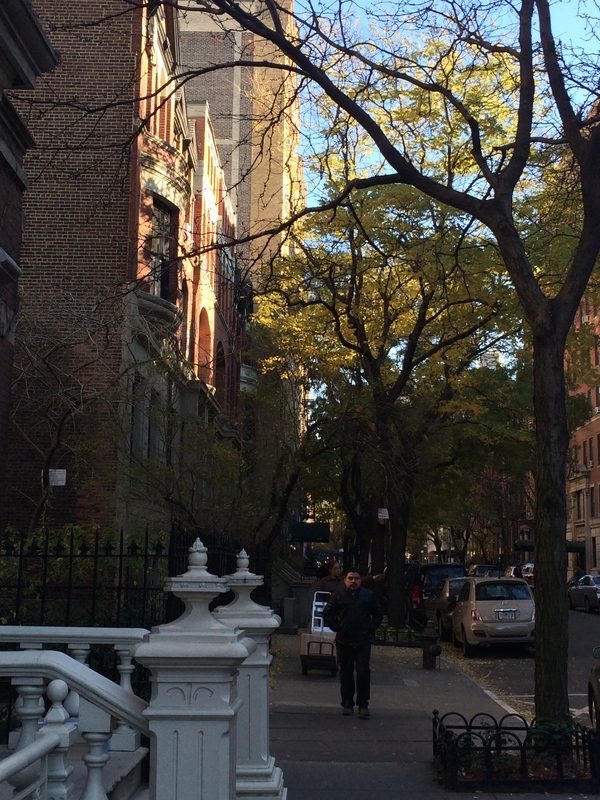 An apartment in the Upper West Side of Manhattan became our home for a week in December. An unexpected bonus of renting at The West Townhouse? Interaction with Monica, one of the owners, who “from the git-go” emailed info concerning transportation from the airport to the apartment and arrival instructions. Biggest bonus of all? Well-marked maps for navigating the city and how to obtain a MetroCard for a week. (Best $31.00 we spent!) She handed us a listing of area markets, restaurants, and nearby sites on the West Side most tourists relish (Think Central Park, The Dakota, and Museum of Natural History.) and then sent us to explore on our own. Our kind of vacation. Spacious bedroom with comfy bed in a quiet part of NYC. Full kitchen for eating in! So, for a week, we felt as if we were blending in with the locals. (With Southern accents, we knew better, but it was fun trying.) We walked the streets and admired the architecture and appointments of the homes in the area. We bought fruit from stands, sipped coffee in little shops, and stopped in for a drink at a local pub. 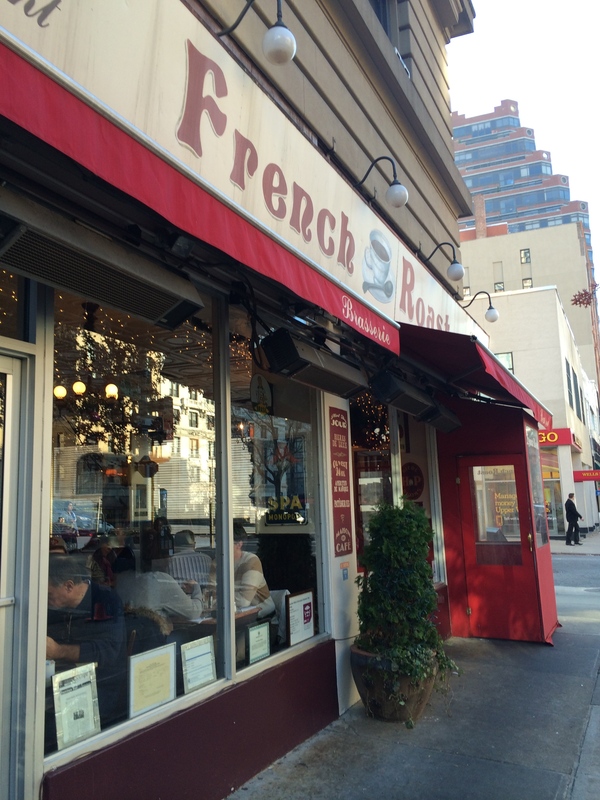 Great little place for coffee and pastries: French Roast Uptown on Broadway, Upper West Side. Dining on croissants and trying to blend in with the locals at French Roast Uptown. Pros for the stay: quiet neighborhood, helpful landlords, proximity to public transportation, kitchen for eating in, and tips on seeing the city in affordable style. Cons — Well, there aren’t many. Since this wasn’t our first trip to NYC, we were fine not staying near the heart of downtown action. In fact, we liked the quiet and public transportation to the “other places” was expedient (the subway more so than the bus) and safe. But you may have other preferences, especially if you’re headed to the city for the first time. And you may like the idea of a big hotel with breakfast on site and a ready concierge. One bonus for an apartment stay: walking through neighborhoods, getting to know the lifestyle. So, think about alternative housing. And think about searching the Internet. Who says you can’t stay in NYC?! 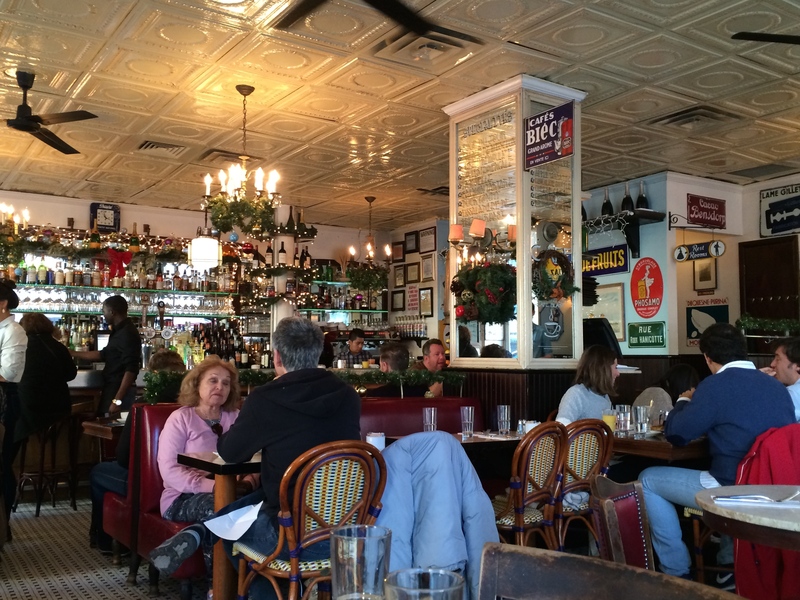 Hope you’ll follow us along in our Travel Series: Christmas Holiday in NYC! We’re Southern folk in awe of the Big Apple! This entry was posted in New York and tagged brownstone, New York City, NYC, The West Townhouse, TripAdvisor, Upper West Side. Bookmark the permalink. 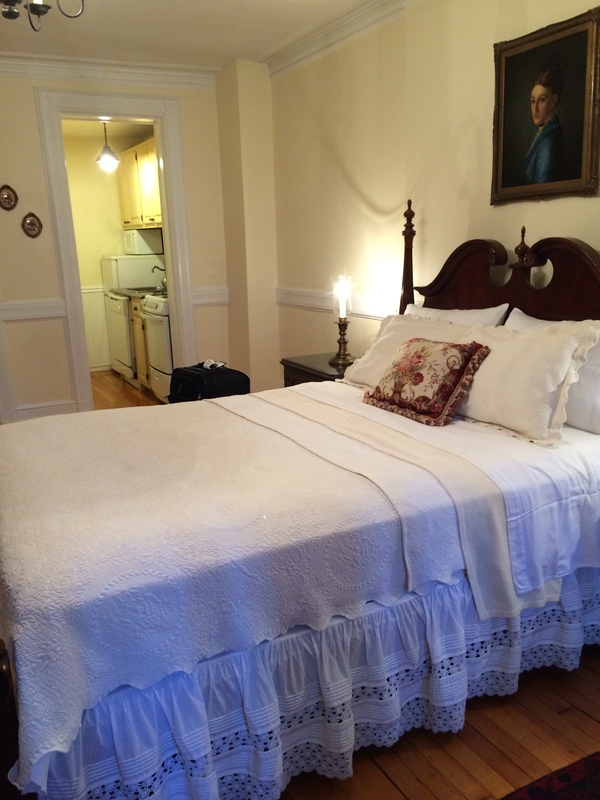 10 Responses to Holiday stay in NYC? Try an apartment! We may be converts. After years of traveling and amassing Marriott points, we’re almost out of free stays. But alternatives are proving to be delightful. Hope you and Terri are enjoying a Kentucky Christmas! Thank you for this! I’ve been to the city twice…but never stayed inside the city. Would love to try this! Hope you will, Dawn. I’m not sure I mentioned one of the best perks: this apt. was less expensive than almost any hotel room we could find. So, with the quiet and the savings, it was a winner for us. Best wishes for happy holidays! I have wanted to try renting for a while but have been concerned about some negative reviews you read. Did you go through a particular company after you read reviews on Trip Adviser or just dealt with the owner? Thanks. Thanks for the comment, Judy. We dealt directly with the owner, but we never would have found the place without the recs on TripAdvisor. Here’s hoping you have good luck also. Thanks for taking a look. It was not luxurious, but it was quite nice. The owner really made the trip special . . . more so than the accommodations! It may not have been divine to everyone, but for us seeking an affordable trip close to several sites we hadn’t seen before, it was perfect. Happy holidays to you as well!